Aspirin (acetylsalicylic acid) and clopidogrel are two major antithrombogenic agents that are widely used for the treatment and prevention of cerebro- and cardiovascular conditions such as stroke. Combined use produces enhanced therapeutic effect. Aspirin and clopidogrel both are esters, and hydrolysis leads to decreased or inactivated therapeutic activity. The aim of the study was to determine whether aspirin and clopidogrel are hydrolyzed by the same enzyme(s), thus reciprocally prolonging the antithrombogenic activity. To test this possibility, microsomes from the liver and intestine were assayed for the hydrolysis of aspirin and clopidogrel. In contrary to the hypothesis, aspirin and clopidogrel were hydrolyzed in a tissue-differential manner. Liver microsomes hydrolyzed both drugs, whereas intestinal microsomes hydrolyzed aspirin only. Consistent with the tissue distribution of two carboxylesterases human carboxylesterase (HCE) 1 and HCE2, recombinant HCE1 hydrolyzed clopidogrel, whereas recombinant HCE2 hydrolyzed aspirin. In addition, hydrolysis of clopidogrel among liver samples was correlated well with the level of HCE1, and hydrolysis of aspirin with HCE2. Certain natural variants differed from the wild-type enzymes on the hydrolysis of aspirin or clopidogrel. In the presence of ethyl alcohol, clopidogrel is converted to ethyl clopidogrel. Carboxylesterases are important pharmacological determinants for drugs containing ester linkages and exhibit a large interindividual variation. The isoform-specific hydrolysis of aspirin and clopidogrel suggests that these two antithrombogenic agents may have pharmacokinetic interactions with different sets of ester drugs, and the altered hydrolysis by polymorphic mutants provides a molecular explanation to the interindividual variation. Platelets are non-nucleated and represent the smallest cellular component in the blood (Gawaz et al., 2005). These cells, also called thrombocytes, play essential roles in thrombogenesis. During thrombogenesis, platelets undergo aggregation, and aggregated platelets are constituents of thrombi (Gawaz et al., 2005). Platelet aggregation is coordinated by several signaling pathways. ADP, for example, activates purinergic receptor P2Y12, evokes morphological changes of platelets, and initiates platelet aggregation (Oury et al., 2006). Likewise, thrombogenic molecule thromboxane A2 activates prostaglandin/thromboxane receptors and induces platelet aggregation and vasoconstriction (Huang et al., 2004). Formation of blood plug or clot is critical in maintaining the continuity of blood vessels and controlling bleeding. However, excessive thrombogenesis is recognized as one of the primary factors involved in the development of cardio- and cerebrovascular diseases such as heart attack and stroke (Grosser et al., 2006). Therefore, antithrombotic therapy has been increasingly used for prophylactic purposes among people who have an increased tendency of thrombogenesis. Aspirin and clopidogrel are two widely used antithrombogenic agents, and coadministration produces enhanced therapeutic effect in many clinical conditions, particularly in high-risk patients with acute coronary syndromes (Cooke et al., 2006). Aspirin and clopidogrel differ on the mechanism of action. Clopidogrel targets the P2Y12 receptor (Savi and Herbert, 2005), whereas aspirin inhibits cyclooxygenase activity (Wu, 2003), an enzymatic action critical in the production of thromboxane A2. In both cases, covalent modifications are involved, leading to irreversible inhibition. Aspirin acetylates the active-site serine-530 of cyclooxygenases; however, clopidogrel does not directly modify its target P2Y12 receptor (Savi and Herbert, 2005). Instead, clopidogrel is converted in vivo by cytochrome P450 enzymes and eventually becomes a reactive thiol metabolite (Savi et al., 2000). It is the thiol metabolite that forms disulfide bond with cysteines in the P2Y12 receptor and blocks its signaling. Aspirin and clopidogrel, on the other hand, share an important chemical feature: both contain a single ester linkage (Needs and Brooks, 1985; Pereillo et al., 2002). More importantly, hydrolysis has profound pharmacological significance. Clopidogrel is hydrolyzed to clopidogrel carboxylate, and this metabolite does not have any therapeutic activity (Caplain et al., 1999). Salicylic acid, the hydrolytic metabolite of aspirin, on the other hand, retains the inhibitory ability against cyclooxygenases (Hinz et al., 2000). However, the inhibition is competitive and significantly less potent (only 10% aspirin). It appears that hydrolysis of both drugs takes place in the gastrointestinal track and/or the liver because the hydrolytic metabolites, immediately following oral administration, are the predominant forms in the systemic circulation (Kees et al., 1996; Heestermans et al., 2006). In addition, the overall hydrolysis of both drugs exhibits a large interindividual variation (Slugg et al., 2000; Lares-Asseff et al., 2004), suggesting that the enzyme(s) for the hydrolysis is expressed differentially depending on individuals or there are polymorphic variants for this enzyme. The liver expresses two major carboxylesterases, including human carboxylesterase (HCE) 1 and HCE2, whereas the gastrointestinal tract expresses predominately HCE2 (Kroetz et al., 1993; Pindel et al., 1997; Schwer et al., 1997). In addition, both enzymes are expressed lower in young infants (Pope et al., 2005). The aim of this study was to determine whether HCE1 and HCE2 are involved in the hydrolysis of aspirin and clopidogrel. Although liver microsomes rapidly hydrolyzed both esters, the intestinal microsomes hydrolyzed aspirin only. Recombinant HCE1 but not HCE2 hydrolyzed clopidogrel, whereas aspirin was primarily hydrolyzed by HCE2. 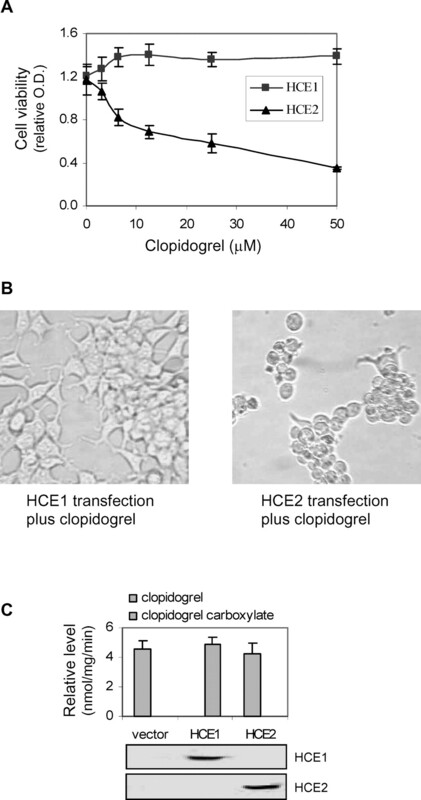 Clopidogrel profoundly inhibited cell proliferation, and the cytotoxic effect was completely abolished by transfection of HCE1. In the presence of ethyl alcohol, clopidogrel is converted to ethyl clopidogrel. These findings provide mechanistic insight into how individual carboxylesterase is involved in the pharmacological determination and toxicity of these two widely used antiplatelet agents. Chemicals and Supplies. Aspirin, 3-[4,5-dimethylthiazolyl-2]-2,5-diphenyltetrazolium bromide (MTT), and para-nitrophenylacetate were from Sigma (St. Louis, MO). Clopidogrel bisulfate was purchased from ChemPacific (Baltimore, MD). Clopidogrel carboxylate was purchased from Toronto Research Chemicals (Toronto, ON, Canada). The goat anti-rabbit-IgG conjugated with alkaline phosphatase was from Pierce (Rockford, IL). Cell culture media, Lipofectamine, and Plus Reagent were purchased from Invitrogen (Carlsbad, CA). Human liver microsomes were from CellzDirect (Austin, TX). Human intestinal microsomes were from BD Bioscience (San Diego, CA). Normal human plasma was from Rhode Island Blood Bank (Providence, RI). Unless otherwise indicated, all other reagents were purchased from Fisher Scientific (Pittsburgh, PA). Enzymatic Assays (Hydrolysis and Transesterification). Hydrolysis of aspirin was carried out at 37°C in a total volume of 100 μl. Samples (100 μg of protein) were prepared in 50 μl of phosphate buffer (0.1 M, pH 7.4) and then mixed with an equal volume of aspirin (usually 2 mM) in the same buffer. The incubations lasted for 10 to 120 min depending on the samples, and the reactions were terminated with 150 μl of acetonitrile containing acetaminophen (38 ng/ml) as the internal standard (IS). The reaction mixtures were subjected to centrifugation for 15 min at 4°C (13,000g). Hydrolysis of clopidogrel was carried out similarly as that of aspirin. Samples (12–25 μg of protein) were prepared in 50 μl of reaction buffer Tris-HCl (50 mM, pH 7.4) mixed with an equal volume of clopidogrel (usually 200 μM) in the same buffer and incubated at 37°C for 20 min. The reactions were terminated and centrifuged as described for the hydrolysis of aspirin; however, naproxen (0.5 μg/ml) served as the IS. The transesterification of clopidogrel was conducted similarly as the hydrolysis of this compound. However, the substrate was first mixed with ethyl alcohol at various concentrations (0–200 mM) before being added to the samples (liver microsomes and lysates of HCE1-transfected cells). It should be noted that the amount of proteins and incubation time varied depending on samples, which ensured the formation of the products was within the linear range. Typically, hydrolysis of aspirin (1 mM) with 25 μg of liver microsomes was linear time up to 60 min, whereas hydrolysis of clopidogrel (100 μM) with 10 μg of liver microsomes up to 40 min. High-Performance Liquid Chromatography. The formation of the hydrolytic metabolites was determined by high-performance liquid chromatography (HPLC; Hitachi-300) with a Chromolith SpeedROD column RP-18e (VWR, Bristol, CT). The supernatants (10–30 μl) of the reaction mixtures were injected and separated by an isocratic (for aspirin) or gradient (clopidogrel) mobile phase. The isocratic mobile phase consisted of 12% methanol and 0.25% acetate acid, pH 3.9. The gradient mobile phase consisted of 4 to 21% acetonitrile (v/v) for the first 4 min and 21 to 70% for second 4 min. The flow rate for both aspirin and clopidogrel was 2 ml/min, and the metabolites were detected by a diode array detector at 238 (salicylic acid) or 230 (clopidogrel carboxylate) nm. All quantifications were performed using peak area ratios and calibration curves generated from the corresponding internal control, otherwise specified. The standard curves were generated with various concentrations of salicylic acid (0.8–110 μg/ml) or clopidogrel carboxylate (0.48–61.2 μg/ml). In both cases, the correlation coefficient consistently exceeded 0.9995. The interday values of relative S.D. were less than 1.5%. The chemical identity of ethyl clopidogrel was confirmed in 60:40 acetonitrile/Tris-HCl, pH 7.4 (20 mM) by electrospray mass spectrometric analysis (Marine API 2000 time of flight; Applied Biosystems, Foster City, CA). Plasmid Constructs and Site-Directed Mutagenesis. Expression constructs encoding human (HCE1 and HCE2) and rat (hydrolases A and B) carboxylesterases were described elsewhere (Xie et al., 2002). Natural variants of HCE1 and HCE2 were prepared by site-directed mutagenesis as described previously (Song et al., 2005). Briefly, complementary oligonucleotides were synthesized to introduce a substitution. The primers were annealed to the corresponding wild type construct (accession no. of HCE1, L07764; accession no. of HCE2, U60553) and subjected to a thermocycler for a total of 15 cycles. The resultant PCR-amplified constructs were then digested with DpnI to remove the nonmutated parent construct. The mutated PCR-amplified constructs were used to transform XL1-Blue bacteria. All mutated constructs were subjected to sequencing analysis to confirm the desired mutation being made without secondary mutations. Transfection. Human embryonic kidney cells (293T) were plated at a density of 60% in Dulbecco's modified Eagle's medium supplemented with 10% fetal calf serum. After reaching 80% confluence, cells were transfected by Lipofectamine and Plus reagent. A plasmid construct or the empty vector (4 μg/100-mm dish) was initially mixed with 20 μl of Plus reagent diluted in 750 μl of serum-free medium for 15 min and then mixed with 30 μl of Lipofectamine reagent diluted in 5 ml of serum-free medium for 15 min. The final transfection complexes were added to a monolayer of 293T cells. After a 3-h incubation, the medium was replaced by normal culture medium and incubated for 48 h in a 37°C humidified incubator with 5.0% CO2. Cells were rinsed and harvested in 1.5 ml of Tris-HCl buffer (50 mM, pH 7.4). The cell suspension was sonicated and cell debris was removed by centrifugation at 13,000g for 15 min at 4°C. The supernatant was assayed for hydrolytic activity toward clopidogrel, aspirin, or para-nitrophenylacetate. Cytotoxicity Assay. Cells (293T) were cultured in six-well plates and transfected with the vector or a construct encoding HCE1 or HCE2 as described above (1 μg/well). After a 12-h incubation, the cells were collected and seeded into 96-well plates at a density of 10,000/well. After an additional 12-h incubation, the medium was replaced with reduced serum medium (1%) containing aspirin or clopidogrel at various concentrations, and the treatment lasted for 36 h. MTT was then added to each well at a final concentration of 1 mg/ml. After a 4-h incubation at 37°C, the medium was gently decanted, and dimethyl sulfoxide (150 μl/well) was added to dissolve the formazan product. The optical density was determined at 570 nm, and the final optical density values were expressed by subtracting the background reading (no seeded cells). Other Assays. Protein concentration was determined with Micro BCA Reagents (Pierce Chemical, Rockford, IL) as described by the manufacturer. Antibodies against distinct carboxylesterases were described elsewhere (Zhu et al., 2000; Xie et al., 2002). The relative intensity of Western blots was densitometrically quantified by Kodak 1D Image Analysis Software (Eastman Kodak, Rochester, NY). Data are presented as mean ± S.D. of at least three separate experiments, except where results of blots are shown, in which case a representative experiment is depicted in the figures. Comparisons between two values were made with Student's t test at p < 0.05. Aspirin Is Hydrolyzed by Liver and Intestinal Microsomes but Clopidogrel by Liver Microsomes Only. Aspirin and clopidogrel both contain a single ester bond. Following oral administration, predominant hydrolytic metabolites are present in the systemic circulation (Kees et al., 1996; Heestermans et al., 2006). Such a rapid conversion suggests that effective first pass elimination occurs with both clopidogrel and aspirin. The initial effort was made to determine whether both agents are comparably hydrolyzed by microsomes from the liver and the gastrointestinal track, two tissues that constitute the first pass elimination of therapeutic agents. Microsomes were used because they contain the highest carboxylesterase activity (Morgan et al., 1994). In addition to microsomes, plasma from health individuals was included as well. The metabolism was monitored by HPLC, and Fig. 1A shows the representative chromatograms. For aspirin metabolism, the retention times of acetaminophen (IS), salicylic acid, and aspirin were 1.04, 2.43, and 4.00 min, respectively. For clopidogrel hydrolysis, the retention times of naproxen (IS), clopidogrel carboxylate, and clopidogrel were 1.92, 3.85, and 8.75 min, respectively. The hydrolysis of aspirin and clopidogrel was determined with pooled samples (at least from five individuals). Both aspirin and clopidogrel were rapidly hydrolyzed by liver microsomes (Fig. 1B). In contrast, intestinal microsomes hydrolyzed aspirin only (Fig. 1B). Plasma, on the other hand, hydrolyzed neither clopidogrel nor aspirin, although evident hydrolysis was detected toward para-nitrophenylacetate (Fig. 1B). These tissues differ markedly on the levels of HCE1 and HCE2. Both HCE1 and HCE2 are abundantly expressed in the liver (Kroetz et al., 1993; Schwer et al., 1997), whereas the gastrointestinal track expresses predominately HCE2 (Schwer et al., 1997). Neither HCE1 nor HCE2 is present in the plasma (Li et al., 2005). Therefore, the differential hydrolysis of aspirin and clopidogrel by these samples suggest that aspirin is a preferable substrate of HCE2, whereas clopidogrel is a preferable substrate of HCE1. Hydrolysis of aspirin and clopidogrel by plasma, intestine, and liver microsomes. A, representative chromatograms containing aspirin, clopidogrel, metabolites, and internal standard. The traces were generated by injecting a mixture (10 μl) of aspirin (8 ng/ml), salicylic acid (31 ng/ml), and IS acetaminophen (38 ng/ml) or a mixture (20 μl) of clopidogrel (8 ng/ml), clopidogrel carboxylate (31 ng/ml), and IS naproxen (0.5 μg/ml). B, hydrolysis of aspirin, clopidogrel, and para-nitrophenylacetate by plasma, intestine, and liver microsomes. For hydrolysis of aspirin, plasma (100 μg protein) or microsomes (25 μg) were prepared in 50 μl of phosphate buffer (0.1 M, pH 7.4) and then mixed with an equal volume of aspirin (usually 2 mM) in the same buffer. The incubations lasted for 20 min depending on the samples, and the reactions were terminated with 150 μl of acetonitrile containing acetaminophen (38 ng/ml). The reaction mixtures were subjected to centrifugation for 15 min at 4°C (12,000g). For hydrolysis of clopidogrel, samples (10–25 μg protein) were prepared in 50 μl of reaction buffer Tris-HCl (50 mM, pH 7.4), mixed with an equal volume of clopidogrel (200 μM) in the same buffer, and incubated at 37°C for 15 to 20 min. The reactions were terminated and centrifuged as described for the hydrolysis of aspirin; however, naproxen (0.5 μg/ml) was used to replace acetaminophen. The metabolism of both aspirin and clopidogrel was monitored by HPLC. Hydrolysis of para-nitrophenylacetate was spectrophotometrically determined as described previously (Xie et al., 2002). All assays were performed in triplicate with three transfection experiments. Hydrolytic rates were expressed as the mean ± S.D. (nanomoles or micromoles per milligram per minute). Hydrolysis by Recombinant Carboxylesterase HCE1 and HCE2. To definitively establish the catalytic preference of HCE1 and HCE2 toward clopidogrel and aspirin, hydrolysis was determined with recombinant HCE1 and HCE2. In addition, recombinant hydrolases A and B, two rat carboxylesterases, were included. Hydrolases A and B are generally considered as rat counterparts of HCE1 and HCE2, respectively (Kroetz et al., 1993; Morgan et al., 1994; Schwer et al., 1997), although rats express more forms of carboxylesterases than humans (based on the searching of the respective genome database). Consistent with the predication, lysates from HCE1- or hydrolase A-transfected cells were highly active toward clopidogrel, whereas lysates from HCE2- or hydrolase B-transfected cells were highly active toward aspirin (Fig. 2A). No hydrolysis of clopidogrel was detected with the lysates from HCE2- or hydrolase B-transfected cells (Fig. 2A). In contrast, some hydrolysis of aspirin (less than 5% of that by HCE2 or hydrolase B) was detected with the lysates from HCE1- or hydrolase A-transfected cells. Western analysis confirmed comparable expression of carboxylesterases in respectively transfected cells (data not shown). To gain kinetic insight, parameters such as Km were determined with recombinant HCE1 and HCE2. The hydrolytic rate was determined as a function of substrate concentrations. Aspirin was assayed from 0.05 to 5.00 mM, whereas clopidogrel was assayed from 3 to 300 μM. Both HCE1 and HCE2 were used for the kinetic study on aspirin, but the kinetic parameters on clopidogrel hydrolysis were determined with HCE1 only. As shown in Fig. 2B, hydrolysis of aspirin by both HCE1 and HCE2 yielded a linear Lineweaver-Burk plot. However, the apparent Km values varied markedly (0.36 mM for HCE2 and 2.03 mM for HCE1). Like-wise, hydrolysis of clopidogrel by HCE1 yielded a linear Lineweaver-Burk plot (Fig. 2C) with the apparent Km value of 58 μM. Liver microsomes produced similar kinetic parameters as recombinant HCE1 and HCE2 with aspirin hydrolysis being a two-enzyme system and clopidogrel being a single-enzyme system (data not shown). Individual Variation of Clopidogrel and Aspirin Hydrolysis. Liver microsomes contain the highest carboxylesterase activity (Morgan et al., 1994), and the kinetic similarity between liver microsomes and recombinant HCE1 and HCE2 suggests that these two carboxylesterases determine the overall hepatic hydrolysis of clopidogrel and aspirin, respectively. We next examined the interindividual variability of hepatic hydrolysis toward each drug and determined whether the variability was correlated with the variability on the expression of HCE1 or HCE2. As shown in Fig. 3A, all microsomal samples hydrolyzed clopidogrel; however, the overall activity varied by as many as 5-fold (column 6 versus 7) (Fig. 3A). 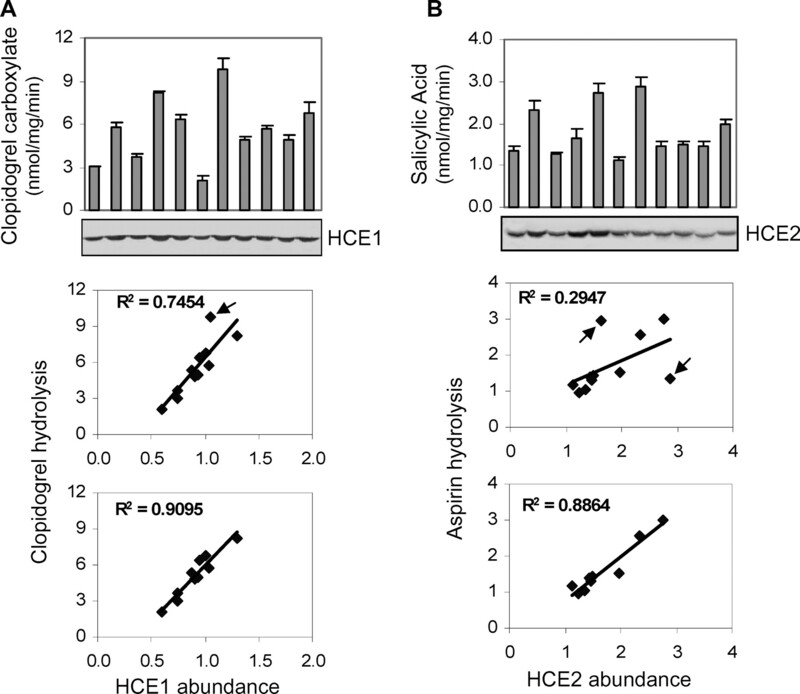 When the hydrolytic rate was plotted against the immunostaining intensity of HCE1, all data points were scattered closely along the regression line, except one outlier (labeled with an arrow). The overall correlation coefficient was 0.7454 (Fig. 3A, middle). The coefficient, however, was further improved (up to 0.9095), when this outlier (lane 7, arrowed) was excluded (Fig. 3A, bottom). As for the hydrolysis of aspirin, the overall individual variation was markedly less (<3-fold) (Fig. 3B, top). When the hydrolytic rate was plotted against the immunostaining intensity of HCE2, the data points were scattered, with a correlation coefficient of 0.2947 only (Fig. 3B, middle). However, the coefficient was improved to 0.8864, when two outliers (lanes 4 and 7, arrowed) were excluded (Fig. 3B, bottom). Hydrolysis of aspirin and clopidogrel by recombinant carboxylesterases and determination of enzyme kinetics. A, hydrolytic rate. Lysates (100 μg) from cells transfected with the empty vector or a cDNA construct encoding HCE1, HCE2, and hydrolase A or B were assayed for their activity to hydrolyze aspirin (1 mM) and clopidogrel (100 μM). The hydrolysis was monitored by HPLC. B, enzyme kinetics of aspirin. Lineweaver-Burk plots of aspirin hydrolysis by recombinant HCE1 and HCE2 were determined at concentrations of 0.05 to 5 mM. C, enzyme kinetics of clopidogrel. Lineweaver-Burk plot of clopidogrel hydrolysis by recombinant HCE1 was determined at concentrations of 3 to 300 μM. The Km and Vmax were calculated by VisualEnzymics (both B and C). Hydrolysis of Aspirin and Clopidogrel by Natural Variants. The correlation study identified several outliers, which likely represent individuals expressing a polymorphistic variant of HCE1 or HCE2. Molecular cloning studies from this and other laboratories have revealed several HCE1 and HCE2 polymorphistic variants (Marsh et al., 2004; Kubo et al., 2005; Zhao et al., 2005), and the database of single-nucleotide polymorphisms from the National Center for Biotechnology Information lists many natural variants of these enzymes as well. As an initial effort to establish the significance of natural variants of carboxylesterases on drug metabolism, we tested some of them for the altered hydrolysis toward aspirin or clopidogrel. As a control, variants were tested for the hydrolysis of standard substrate para-nitrophenylacetate. Hydrolysis of aspirin and clopidogrel by individual liver samples and correlation analysis of the hydrolysis with the abundance of HCE1. A, clopidogrel hydrolysis by liver microsomes. Individual liver samples (25 μg) were incubated with clopidogrel with a final concentration of 100 μM, and the formation of clopidogrel carboxylate was detected by HPLC. For Western blots, samples (1 μg) were subjected to SDS-polyacrylamide gel electrophoresis and transferred electrophoretically to a trans-blot nitrocellulose membrane. The immunoblots were blocked in 5% nonfat dry milk, incubated with the antibody (10 μg/ml) against HCE1, and detected by alkaline phosphatase-conjugated anti-rabbit IgG. The immunostaining intensity was quantified by densitometry and plotted with the hydrolytic rate of each sample toward clopidogrel. B, aspirin hydrolysis by liver microsomes. Hydrolysis and correlation analysis were performed as described for clopidogrel. However, aspirin (1 mM) was used to replace clopidogrel, and the correlation analysis was conducted with the level of HCE2 (3 μg of proteins was used for Western blot). The results on the hydrolysis by natural variants are summarized in Fig. 4. All HCE1 variants except HCE1C70F showed similar activity as wild-type HCE1 on the hydrolysis of clopidogrel (Fig. 4A). HCE1C70F, on the other hand, was expressed to a much lower level (Fig. 4A, bottom). Increased amounts of the lysates from HCE1C70F-transfected cells were assayed, and little hydrolysis was consistently observed, suggesting that this variant, in addition to decreased expression, is catalytically inefficient (Song et al., 2004). Among the HCE2 variants tested, three showed some decreases on the hydrolysis of aspirin with the maximal decrease being 40% (HCE2A139T) (Fig. 4B). In contrast, the alteration on the hydrolysis of para-nitrophenylacetate varied depending on a variant. HCE2R180H showed increased hydrolysis, whereas the hydrolysis was decreased with HCE2F485V. In contrast to HCE1 variants, all HCE2 variants were expressed to a comparable extent (Fig. 4B, bottom). We are in the process of preparing more natural variants of carboxylesterases, which will serve as tools to fully evaluate the pharmacological significance of polymorphisms of these enzymes. Hydrolysis of Clopidogrel Represents Detoxication. Altered hydrolysis of aspirin and clopidogrel may have profound clinical consequence in terms of antiplatelet aggregation, given the fact that hydrolytic metabolites of both aspirin and clopidogrel have either decreased or no therapeutic activity. Next, we examined whether hydrolysis of either drug has any toxicological significance. The hydrolytic metabolites of both aspirin and clopidogrel are carboxylate; thus, the rate of uptake likely affects their cytotoxicity. To minimize the effect of uptake, we examined the toxicity in cells where the production of the carboxylate metabolites occurred intracellularly and was regulated by transfection of HCE1 and HCE2. The transfected cells were seeded into 96-well plates and treated with the respective parent compound at various concentrations. The cytotoxicity was monitored for cell viability by MTT assay and microscopic examination. The results on the toxicity study are summarized in Fig. 5. Cells transfected with HCE2 showed marked decreases on the cell viability, and the decrease was significant even when clopidogrel was assayed as low as 3 μM (Fig. 5A). A similar decrease was detected in the cells transfected with the vector (data not shown). In contrast, cells transfected by HCE1 showed no changes on the cell viability. Under the bright field, HCE2-transfected cells were rounded and shrank, and the nuclei were condensed (Fig. 5B, right). In contrast, HCE1-transfected cells were spread, and the projects were well extended (Fig. 5B, left). These results suggest that clopidogrel is more toxic than its metabolite; thus, hydrolysis represents detoxication. 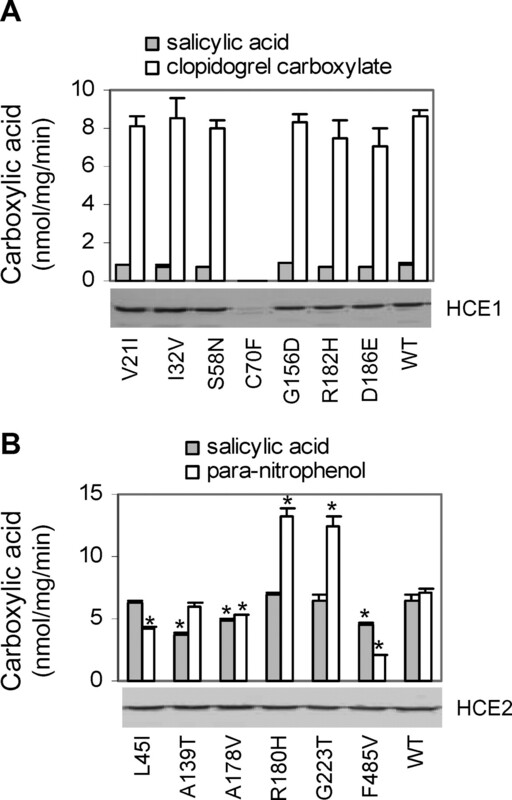 The hydrolysis and expression of HCE1 or HCE2 were confirmed as shown in Fig. 5C. In contrast, no evident toxicity was detected with aspirin even at 2 mM, whether or not cells were transfected with a carboxylesterase construct or the corresponding vector (data not shown). Clopidogrel Was Converted to Ethyl Clopidogrel in the Presence of Ethyl Alcohol. In addition to catalyzing hydrolytic reaction, HCE1 and hydrolase A have been shown to catalyze transesterification (Brzezinski et al., 1994; Morgan et al., 1994). Clopidogrel is a methyl ester and probably converted to ethyl clopidogrel in the presence of ethyl alcohol. To test this possibility, lysates from HCE1-transfected cells were incubated with clopidogrel in the presence of ethyl alcohol. The formation of ethyl clopidogrel was monitored by HPLC and liquid chromatography-mass spectrometry. Figure 6A shows the representative chromatograms from the incubation in the presence of ethyl alcohol (200 mM). Two peaks representing clopidogrel metabolites were identified, and they corresponded to clopidogrel carboxylate and ethyl clopidogrel, respectively (Top of Fig. 6A). Ethyl clopidogrel had a slightly prolonged retention time compared with the parent drug (9.07 versus 8.75 min). The mass of ethyl clopidogrel was confirmed to be 335, consistent with the combined mass of clopidogrel and CH2 (321 + 14) (Fig. 6A, bottom). Hydrolysis of aspirin and clopidogrel by HCE1 or HCE2 variants. A, hydrolysis by HCE1 variants. Lysates (15 μg) from cells transfected with a cDNA construct encoding HCE1 or a variant were assayed for the activity to hydrolyze clopidogrel (100 μM) or aspirin (1 mM). The hydrolysis was monitored by HPLC. The level of HCE1 or a variant was determined by Western blots with 1 μg of lysates. B, hydrolysis by HCE2 variants. Lysates (100 μg) from cells transfected with HCE2 construct were assayed for the hydrolysis of aspirin (1 mM) or para-nitrophenylacetate (1 mM). *, significantly different between cells transfected with an HCE2 variant and those transfected with wild-type HCE2 (p < 0.05). We next examined the formation of ethyl clopidogrel as a function of ethyl alcohol. This is of significance because it specifies whether the formation of ethyl clopidogrel varies depending on the amount of alcohol consumption. No ethyl clopidogrel was available to precisely quantify the amount of formed ethyl clopidogrel. A preliminary study demonstrated that all samples (no matter how much ethyl alcohol was added) yielded very similar totality of the areas of the peaks corresponding to clopidogrel, ethyl clopidogrel, and the carboxylate, suggesting that these compounds have a similar UV absorption profile. Therefore, percentages of a peak area (e.g., from clopidogrel) over the area totaled from three peaks were used for the relative changes on clopidogrel, ethyl clopidogrel, and clopidogrel carboxylate. As shown in Fig. 6B, increased ethyl alcohol proportionally increased the formation of ethyl clopidogrel accompanied by proportional decreases on the production of clopidogrel carboxylate, the hydrolytic metabolite. Interestingly, the parent drug was also increased as increasing amounts of ethyl alcohol were used, suggesting that the total metabolism of clopidogrel (hydrolysis and transesterification) is decreased in the presence of ethyl alcohol. To determine whether the ratio of hydrolysis over transesterification is constant, several individual liver samples were assayed, and the formation of clopidogrel carboxylate and ethyl clopidogrel was simultaneously monitored. As shown in Fig. 6C, all samples produced both hydrolytic and transesterification metabolites. However, the formation of hydrolytic metabolite exhibited a larger variation than that of ethyl clopidogrel. Interestingly, samples (e.g., column 1 versus 3) produced comparable levels of ethyl clopidogrel but differed markedly on the level of clopidogrel carboxylate. Effect of clopidogrel hydrolysis on cell viability. A, cell viability. Cells (293T) were cultured in six-well plates and transfected with the vector or a construct encoding HCE1 or HCE2. After a 12-h incubation, the cells were collected and seeded into 96-well plates at a density of 10,000/well. After an additional 12-h incubation, cells were treated with clopidogrel at various concentrations (0–50 μM) for 36 h. Cell viability was determined with MTT assay as described under Materials and Methods. The cell viability was expressed as relative optical density values. All concentration points are statistically significant between clopidogrel treatment and vehicle control in HCE2- or vector-transfected cells and between HCE1- and HCE2-transfected cells. B, morphological analysis. The images were taken under bright field from cells treated with 50 μM clopidogrel (250×). C, media were collected from clopidogrel-treated cells (vector, HCE1, or HCE2 transfected) and analyzed for the level of clopidogrel and clopidogrel carboxylate by HPLC. The expression of HCE1 and HCE2 in respectively transfected cells was monitored by Western blots. Transesterification of clopidogrel. A, representative chromatograms generated from incubation with clopidogrel and ethyl alcohol. Lysates (60 μg) from HCE1-transfected cells were incubated with clopidogrel (0.2 mM) and ethyl alcohol (200 mM) at 37°C for 20 min. The reaction was terminated by acetonitrile and analyzed by HLPC (top) or liquid chromatography-mass spectrometry (bottom). B, formation of ethyl alcohol as a function of ethyl alcohol. Incubations were conducted with clopidogrel (0.2 mM) and ethyl alcohol (0–200 mM). The reactions were terminated by acetonitrile and analyzed by HPLC. The results are expressed as percentages (a peak area of clopidogrel or a metabolite over the area totaled from clopidogrel, clopidogrel carboxylate, and ethyl clopidogrel). C, formation of ethyl alcohol by individual liver microsomes. Human microsomes (80 μg) were incubated with clopidogrel (0.1 mM) and ethyl alcohol (200 mM) at 37°C for 20 min. The reactions were terminated by acetonitrile and analyzed by HLPC. Again, the results are expressed as percentages. Aspirin and clopidogrel are two widely used antithrombogenic agents, and coadministration produces enhanced therapeutic effect (Cooke et al., 2006). Aspirin and clopidogrel both contain a single ester bond, and hydrolysis leads to decreased or inactivated antiplatelet activity. Carboxylesterases HCE1 and HCE2 represent two major hydrolases that metabolize drugs and other xenobiotics. The objectives of this study were to determine whether both carboxylesterases are involved in the hydrolysis of aspirin and clopidogrel and whether polymorphic variants differ from the corresponding wild-type enzymes on the hydrolysis. In this study, we have demonstrated that hydrolysis of aspirin and clopidogrel occurs in an isozyme-specific manner. Clopidogrel is hydrolyzed by HCE1, whereas aspirin is hydrolyzed predominately by HCE2. Certain natural variants show altered hydrolytic activity. Although aspirin undergoes hydrolytic biotransformation, clopidogrel undergoes both hydrolysis and transesterification depending on the presence of ethyl alcohol (Fig. 7). Cells exposed to clopidogrel show marked decreases on the viability, but the cytotoxic effect is abolished by transfection of HCE1. Therefore, hydrolysis of clopidogrel has both pharmacological and toxicological significance. Although there are many hydrolytic enzymes, HCE1 and HCE2 likely represent the primary enzymes that hydrolyze clopidogrel and aspirin, respectively. Several lines of evidence support this notion. First, at any time points following oral administration, the hydrolytic metabolites are the predominant forms in the systemic circulation (Kees et al., 1996; Heestermans et al., 2006). Such a rapid conversion suggests that the hydrolysis takes place effectively in the gastrointestinal track and the liver, where HCE1 and HCE2 are abundantly expressed (Kroetz et al., 1993; Pindel et al., 1997; Schwer et al., 1997). Second, in this study, we have demonstrated that recombinant HCE1 is highly active toward clopidogrel, and recombinant HCE2 is highly active toward aspirin (Fig. 2). In addition, among individual liver samples, hydrolysis of clopidogrel is correlated with the level of HCE1, and hydrolysis of aspirin is correlated with the level of HCE2 (Fig. 3). Third, recombinant HCE1 and HCE2 produce similar kinetic parameters as liver microsomes in hydrolyzing clopidogrel and aspirin (Fig. 2B), respectively, suggesting that these two enzymes represent the primary hydrolytic activity in liver microsomes toward each drug. Several other enzymes such as butyrylcholinesterase have been shown to hydrolyze aspirin (Masson et al., 1998). However, these enzymes have a Km value of millimolar level; therefore, HCE2 (Km = 360 μM; Fig. 2C) is the most kinetically favorable hydrolase toward aspirin. 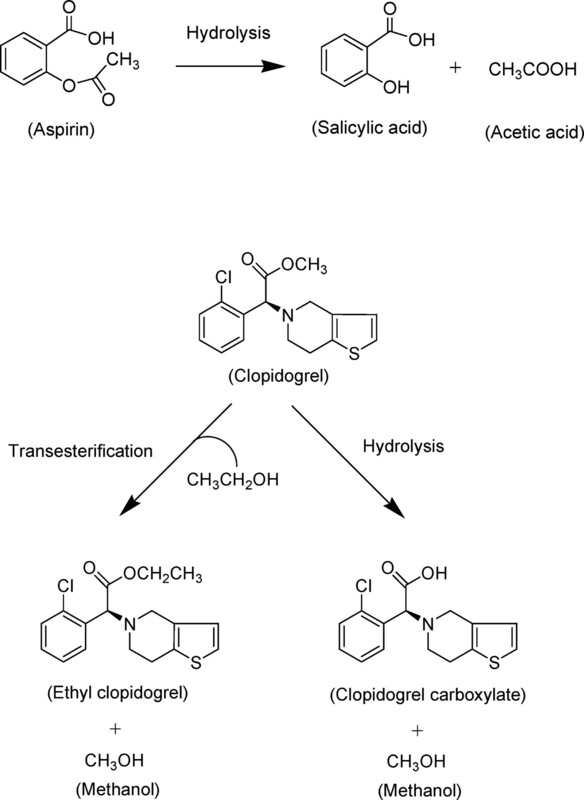 Biotransformation pathway of aspirin and clopidogrel by carboxylesterases. The hydrolytic preference by HCE1 and HCE2 is likely related to the sizes of the acid and alcohol moieties of ester molecules. HCE1 preferably hydrolyzes esters with a larger acid moiety, whereas the opposite is true with HCE2. Based on mol. wt., the acid moiety (clopidogrel carboxylate) of clopidogrel is 10 times as big as the alcohol moiety (methanol); therefore, it is hydrolyzed by HCE1 but not HCE2. In contrast, the acid moiety of aspirin is much smaller than the alcohol moiety (mol. wt. ratio, 60 versus 138); thus, aspirin is predominately hydrolyzed by HCE2. The alcohol/acid size-based preference applies well to compounds with multiple ester bonds as well. The psychomotor stimulant cocaine, for example, contains two ester bonds, and complete hydrolysis produces ecgonine, methanol, and benzoic acid (Brzezinski et al., 1994). Among these products, ecgonine is the largest and acts as the acid moiety relatively to methanol but the alcohol moiety relatively to benzoic acid. Consistent with the alcohol/acid size-based preference, HCE1 hydrolyzes ecgoninemethyl ester, whereas HCE2 hydrolyzes benzoate-ecgoninyl ester (Brzezinski et al., 1994; Pindel et al., 1997). In addition to the relative sizes, the shapes of respective moieties likely contribute to the hydrolytic preference as well, particularly when the acid and alcohol moieties have similar mol. wt. The isozyme-specific hydrolysis of aspirin and clopidogrel suggests that they have pharmacokinetic interactions with different sets of ester drugs. Aspirin may interact with anticancer agent irinotecan and protease inhibitor nafamostat, and both of them are predominantly hydrolyzed by HCE2 (Wu et al., 2002; Yamaori et al., 2006). Likewise, clopidogrel may interact with the anti-influenza agent oseltamivir, which is hydrolyzed by HCE1 but not HCE2 (Shi et al., 2006). Although aspirin and clopidogrel exert pharmacodynamic interaction through the anticlotting effect (Cooke et al., 2006), their isozyme-specific hydrolysis provides the molecular basis for the lack of hydrolytic interaction. However, they may have metabolizing interactions based on other types of enzyme systems, particularly the cytochrome P450 system. In humans, low-dose aspirin has been shown to significantly increase CYP3A4 activity (Chen et al., 2003). On the other hand, clopidogrel is a prodrug, and only the oxidized metabolite containing a reactive thiol blocks the signaling of P2Y12 receptor and confers antiplatelet activity (Savi et al., 2000). Given the fact that oxidation of clopidogrel is catalyzed by CYP3A4 and CYP3A5 (Savi et al., 2000), increased CYP3A4 activity by low-dose aspirin likely increases the activation of clopidogrel, thus enhancing the efficacy of this antiplatelet prodrug. Although the clinical significance remains to be established regarding aspirin-increased CYP3A4 activity on clopidogrel activation, it has been reported that altered activities on CYP3A4 or CYP3A5 have a profound effect on the clinical outcomes of clopidogrel (Lau et al., 2004; Suh et al., 2006). The hepatic predominance on the hydrolysis of clopidogrel provides an important pharmacological advantage for this prodrug, particularly on the generation of the active metabolite. Both CYP3A4 and CYP3A5 are highly expressed in the gastrointestinal track. As a result, clopidogrel is activated in the gastrointestinal track before being hydrolyzed in the liver. It remains to be determined whether the active metabolite is a substrate of HCE1 and whether hydrolysis of the active metabolite represents inactivation. It is likely that the active metabolite generated in the gastrointestinal track covalently modifies the P2Y12 receptor and exerts its therapeutic effect in the portal vein. On the other hand, lack of gastrointestinal hydrolysis of clopidogrel may have toxicological significance. In this study, we have shown that the parent drug but not the hydrolytic metabolite is cytotoxic (Fig. 5). The presence of a high concentration of clopidogrel in the gastrointestinal track may damage the mucosa, particularly when a large loading dose is administered. In the presence of ethyl alcohol, significant amount of clopidogrel is converted to ethyl clopidogrel. The formation of ethyl clopidogrel is proportionally increased as higher amounts of ethyl alcohol are used (Fig. 6B). However, prolonged incubation leads to disappearance of ethyl clopidogrel accompanied by increased hydrolytic metabolite (data not shown), suggesting that ethyl clopidogrel is a substrate of HCE1 as well. The extent of transesterification in humans remains to be determined. Based on the legal limit of alcohol consumption (∼25 mM), it is expected that ethyl clopidogrel is ∼15% of the hydrolytic metabolite (Fig. 6B). However, the formation of ethyl clopidogrel is likely increased substantially because the concentration of alcohol in the liver is expectedly higher than that in the blood concentration, particularly at the time right after consumption. Interestingly, aspirin has been shown to inhibit alcohol dehydrogenase, a major enzyme for the first pass elimination of ethyl alcohol (Gentry et al., 1999). Therefore, the copresence of clopidogrel, aspirin, and alcohol likely increases further the formation of ethyl clopidogrel. The pharmacological potential of ethyl clopidogrel remains to be established. Initial study has shown that ethyl alcohol increases the cytotoxic effect of clopidogrel (J. Yang and B. Yan, unpublished data), pointing to enhanced biological activity. On the other hand, ethyl alcohol prolongs the presence of the parent drug (Fig. 6B), which may have a profound pharmacological consequence. Based on the values of Cmax, the concentration of clopidogrel (parent drug) is 4 times as much as the active metabolite (oxidized clopidogrel), and the concentration of the hydrolytic metabolite (clopidogrel carboxylate) is approximately 10,000 times as much as oxidized clopidogrel (Heestermans et al., 2006). Therefore, the prolonged presence of clopidogrel by ethyl alcohol likely allows the oxidation to be proceeded longer, thus increasing the pharmacological activity (Heestermans et al., 2006), particularly when ethyl alcohol is moderately consumed. In summary, our work points to several important conclusions. First, clopidogrel is hydrolyzed by HCE1, whereas aspirin is hydrolyzed predominately by HCE2. Therefore, clopidogrel and aspirin lack hydrolytic interactions. Second, several natural variants of HCE1 and HCE2 show altered activity toward clopidogrel or aspirin; thus, genetic polymorphism on each carboxylesterase may alter the pharmacokinetics and ultimately the efficacy. Third, clopidogrel is converted to ethyl clopidogrel in the presence of ethyl alcohol; therefore, consumption of alcohol may alter the hydrolytic elimination of clopidogrel. Given the fact that hydrolytic biotransformation represents pharmacological inactivation (clopidogrel) or reduction (aspirin), identification of the primary enzyme for the hydrolysis of each drug provides a molecular basis for individual variation, drug-drug interaction, and toxicity regarding the use of these two antithrombogenic agents. This work was supported by National Institutes of Health Grants R01ES07965, R01GM61988, and F05 AT003019. The chemical identification of ethyl clopidogrel was determined through the core facility supported by National Institutes of Health Grant P20RR01645. ABBREVIATIONS: HCE, human carboxylesterase; MTT, 3-[4,5-dimethylthiazolyl-2]-2,5-diphenyltetrazolium bromide; IS, internal standard; HPLC, high-performance liquid chromatography. Brzezinski MR, Abraham TL, Stone CL, Dean RA, and Bosron WF (1994) Purification and characterization of a human liver cocaine carboxylesterase that catalyzes the production of benzoylecgonine and the formation of cocaethylene from alcohol and cocaine. Biochem Pharmacol 48: 1747–1755. Caplain H, Donat F, Gaud C, and Necciari J (1999) Pharmacokinetics of clopidogrel. Semin Thromb Hemost 25 (Suppl 2): 25–28. Chen XP, Tan ZR, Huang SL, Huang Z, Ou-Yang DS, and Zhou HH (2003) Isozyme-specific induction of low-dose aspirin on cytochrome P450 in healthy subjects. Clin Pharmacol Ther 73: 264–271. Cooke GE, Liu-Stratton Y, Ferketich AK, Moeschberger ML, Frid DJ, Magorien RD, Bray PF, Binkley PF, and Goldschmidt-Clermont PJ (2006) Effect of platelet antigen polymorphism on platelet inhibition by aspirin, clopidogrel, or their combination. J Am Coll Cardiol 47: 541–546. Gawaz M, Langer H, and May AE (2005) Platelets in inflammation and atherogenesis. J Clin Investig 115: 3378–3384. Gentry RT, Baraona E, Amir I, Roine R, Chayes ZW, Sharma R, and Lieber CS (1999) Mechanism of the aspirin-induced rise in blood alcohol levels. Life Sci 65: 2505–2512. Grosser T, Fries S, and FitzGerald GA (2006) Biological basis for the cardiovascular consequences of COX-2 inhibition: therapeutic challenges and opportunities. J Clin Investig 116: 4–15. Heestermans AA, van Werkum JW, Schomig E, ten Berg JM, and Taubert D (2006) Clopidogrel resistance caused by a failure to metabolize clopidogrel into its metabolites. J Thromb Haemost 4: 1143–1145. Hinz B, Kraus V, Pahl A, and Brune K (2000) Salicylate metabolites inhibit cyclooxygenase-2-dependent prostaglandin E(2) synthesis in murine macrophages. Biochem Biophys Res Commun 274: 197–202. Kees F, Jehnich D, and Grobecker H (1996) Simultaneous determination of acetylsalicylic acid and salicylic acid in human plasma by high-performance liquid chromatography. J Chromatogr B Biomed Appl 677: 172–177. Huang JS, Ramamurthy SK, Lin X, and Le Breton GC (2004) Cell signaling through thromboxane A2 receptors. Cell Signal 16: 521–533. Kroetz DL, McBride OW, and Gonzalez FJ (1993) Glycosylation-dependent activity of baculovirus-expressed human liver carboxylesterases: cDNA cloning and characterization of two highly similar enzyme forms. Biochemistry 32: 11606–11617. Kubo T, Kim SR, Sai K, Saito Y, Nakajima T, Matsumoto K, Saito H, Shirao K, Yamamoto N, Minami H, et al. (2005) Functional characterization of three naturally occurring single nucleotide polymorphisms in the CES2 gene encoding carboxylesterase 2 (HCE-2). Drug Metab Dispos 33: 1482–1487. Lares-Asseff I, Juarez-Olguin H, Flores-Perez J, Guille-Perez A, and Vargas A (2004) Pharmacokinetics and metabolic rates of acetyl salicylic acid and its metabolites in an Otomi ethnic group of Mexico. Biol Pharm Bull 27: 706–709. 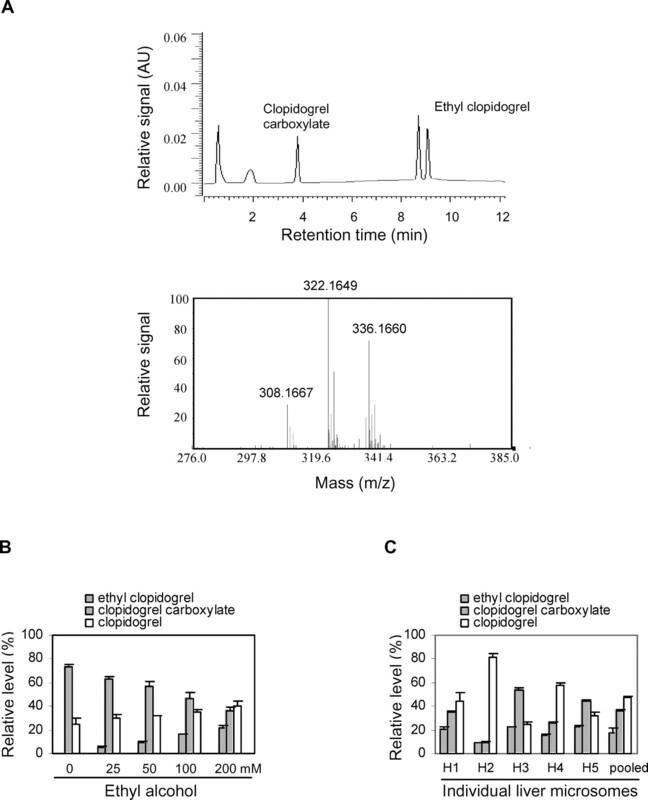 Lau WC, Gurbel PA, Watkins PB, Neer CJ, Hopp AS, Carville DG, Guyer KE, Tait AR, and Bates ER (2004) Contribution of hepatic cytochrome P450 3A4 metabolic activity to the phenomenon of clopidogrel resistance. Circulation 109: 166–171. Li B, Sedlacek M, Manoharan I, Boopathy R, Duysen EG, Masson P, and Lockridge O (2005) Butyrylcholinesterase, paraoxonase, and albumin esterase, but not carboxylesterase, are present in human plasma. Biochem Pharmacol 70: 1673–1684. Masson P, Froment MT, Fortier PL, Visicchio JE, Bartels CF, and Lockridge O (1998) Butyrylcholinesterase-catalysed hydrolysis of aspirin, a negatively charged ester, and aspirin-related neutral esters. Biochim Biophys Acta 1387: 41–52. Marsh S, Xiao M, Yu J, Ahluwalia R, Minton M, Freimuth RR, Kwok PY, and McLeod HL (2004) Pharmacogenomic assessment of carboxylesterases 1 and 2. Genomics 84: 661–668. Morgan EW, Yan B, Greenway D, Petersen DR, and Parkinson A (1994) Purification and characterization of two rat liver microsomal carboxylesterases (hydrolase A and B). Arch Biochem Biophys 315: 495–512. Needs CJ and Brooks PM (1985) Clinical pharmacokinetics of the salicylates. Clin Pharmacokinet 10: 164–177. Oury C, Toth-Zsamboki E, Vermylen J, and Hoylaerts MF (2006) The platelet ATP and ADP receptors. Curr Pharm Des 12: 859–875. Pereillo JM, Maftouh M, Andrieu A, Uzabiaga MF, Fedeli O, Savi P, Pascal M, Herbert JM, Maffrand JP, and Picard C (2002) Structure and stereochemistry of the active metabolite of clopidogrel. Drug Metab Dispos 30: 1288–1295. Pindel EV, Kedishvili NY, Abraham TL, Brzezinski MR, Zhang J, Dean RA, and Bosron WF (1997) Purification and cloning of a broad substrate specificity human liver carboxylesterase that catalyzes the hydrolysis of cocaine and heroin. J Biol Chem 272: 14769–14775. Pope CN, Karanth S, Liu J, and Yan B (2005) Comparative carboxylesterase activities in infant and adult liver and their in vitro sensitivity to Chlorpyrifos oxon. Regul Toxicol Pharmacol 42: 64–69. Savi P and Herbert JM (2005) Clopidogrel and ticlopidine: P2Y12 adenosine diphosphate-receptor antagonists for the prevention of atherothrombosis. Semin Thromb Hemostasis 31: 174–183. 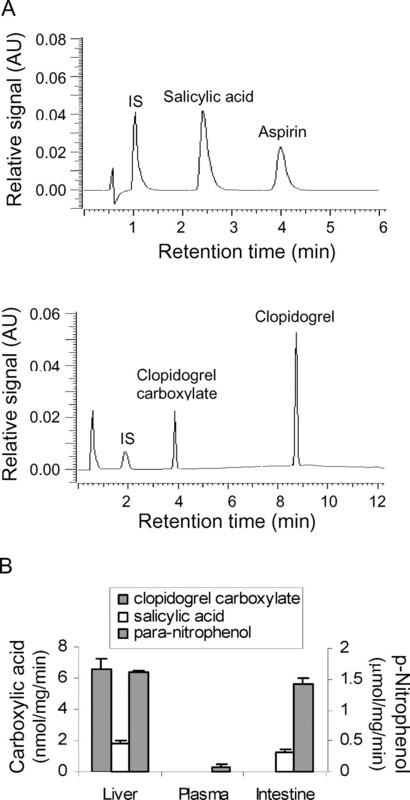 Savi P, Pereillo JM, Uzabiaga MF, Combalbert J, Picard C, Maffrand JP, Pascal M, and Herbert JM (2000) Identification and biological activity of the active metabolite of clopidogrel. Thromb Haemost 84: 891–896. Schwer H, Langmann T, Daig R, Becker A, Aslanidis C, and Schmitz G (1997) Molecular cloning and characterization of a novel putative carboxylesterase, present in human intestine and liver. Biochem Biophys Res Commun. 233: 117–120. Shi D, Yang J, Yang D, LeCluyse EL, Black C, You L, Akhlaghi F, and Yan B (2006) Anti-influenza viral prodrug oseltamivir is activated by carboxylesterase HCE1 and the activation is inhibited by anti-platelet agent clopidogrel. J Pharmacol Exp Ther 319: 1477–1484. Slugg PH, Much DR, Smith WB, Vargas R, Nichola P, and Necciari J (2000) Cirrhosis does not affect the pharmacokinetics and pharmacodynamics of clopidogrel. J Clin Pharmacol 40: 396–401. Song X, Gragen S, Li Y, Ma Y, Liu J, Yang D, Matoney L, and Yan B (2004) Intramolecular disulfide bridges are required for folding hydrolase B into a catalytically active conformation but not for maintaining it during catalysis. Biochem Biophys Res Commun 319: 1072–1080. Song X, Li Y, Liu J, Mukundan M, and Yan B (2005) Simultaneous substitution of phenylalaine-305 and aspartate-318 of rat PXR by the corresponding human residues abolishes the ability to transactivate the cytochrome P4503A23 promoter. J Pharmacol Exp Ther 312: 571–582. Suh JW, Koo BK, Zhang SY, Park KW, Cho JY, Jang IJ, Lee DS, Sohn DW, Lee MM, and Kim HS (2006) Increased risk of atherothrombotic events associated with cytochrome P450 3A5 polymorphism in patients taking clopidogrel. Can Med Assoc J 174: 1715–1722. Wu KK (2003) Aspirin and other cyclooxygenase inhibitors: new therapeutic insights. Semin Vasc Med 3: 107–112. Wu MH, Yan B, Humerickhouse R, and Dolan ME (2002) Irinotecan activation by human carboxylesterases in colorectal adenocarcinoma cells. Clin Cancer Res 8: 2696–2700. Xie M, Yang D, Liu L, Xue B, and Yan B (2002) Rodent and human carboxylesterases: immuno-relatedness, overlapping substrate specificity, differential sensitivity to serine inhibitors, and tumor-related expression. Drug Metab Dispos 30: 541–547. Yamaori S, Fujiyama N, Kushihara M, Funahashi T, Kimura T, Yamamoto I, Sone T, Isobe M, Ohshima T, Matsumura K, et al. (2006) Involvement of human blood arylesterases and liver microsomal carboxylesterases in nafamostat hydrolysis. Drug Metab Pharmacokinet 21: 147–155. Zhao B, Natarajan R, and Ghosh S (2005) Human liver cholesteryl ester hydrolase: cloning, molecular characterization, and role in cellular cholesterol homeostasis. Physiol Genomics 23: 304–310. Zhu W, Song L, Matoney L, LeCluyse E, and Yan B (2000) Dexamethasone differentially regulates the expression of carboxylesterase genes in humans and rats. Drug Metab Dispos 28: 186–191.